Myrtle Beach is many things – it’s a powerful metropolis, a vacation destination, a seaside city, but most importantly, it’s amazingly fun. Known for its beaches that are the color of brown sugar as well as its beachfront boardwalk, Myrtle Beach has become an iconic American hotspot that not only knows how to treat its residents, but its visitors as well. Airports are often regarded as busy places, especially those ones that provide a direct link to vacation sites. MYR Airport experiences a large amount of tourists from around the world as well as US locals flocking the Myrtle Beach area. Given their strategic position as a link to the Grand Strand, the Airport has been successfully gaining great reviews as they provide a clean and facilitated environment to all the passengers. Waiting at airports is nothing out of the ordinary but at MYR Airport; you can pass your waiting time quite conveniently. Passengers not only get to enjoy free Wi-Fi but the building also features wide walkways with reasonable amount of seating. Moreover, you won’t have to face any frustration related to unclean washrooms. The MYR Airport is situated near the Market Common shopping center. MYR airport also known as the Myrtle Beach International Airport is among one of the finest places you will find in Myrtle Beach.It has been serving as a gateway to the Grand Strand and runs along the coast beginning from the Little River to Georgetown in the state of South Carolina. The summer season in the USA is all about getting ready for beach time and it is not surprising to see a large traffic of people exiting the MYR Airport ready to begin their sandy, flip flop summer vacation. Because Myrtle Beach International Airport is only three miles from downtown, there’s typically a lot of congestion surrounding the facility. This makes it even more crucial to reserve reliable transportation, especially when it’s with professional shuttle companies– contact us today to schedule a pick-up and/or drop-off, and be sure to ask if there are any existing deals so you can not only ride comfortably, but cheaply. 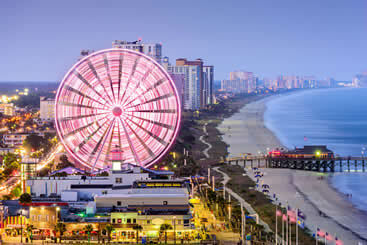 Myrtle Beach is home to a variety of family-friendly amusements, making it the perfect place to have an affordable trip with the kids, whether it’s Broadway Beach, which is home to an aquarium, amusement park, and several small shops or the classic Myrtle Beach Boardwalk, which is a perfect place to watch the sunset. Have everybody spend the afternoon together by reserving a private van from area transfer providers, a great way to save time as well as memories. Gift shops may seem like a dime a dozen when you’re on vacation, but nothing compares to the Gay Dolphin Gift Cove, which is the country’s largest gift store. Check out the massive building by ordering your very own private sedan from local service providers. While you’re out, take an intimate ride to one of the beach city’s most intimate of locations, The Myrtle Beach SkyWheel, which offers each guest a light show as well as a grandiose view of the entire city. Give your family the gift of a relaxing vacation by reserving a private SUV from us, checking out one of Myrtle Beach’s biggest staples – amusement parks. Visit the Family Kingdom Amusement Park, which is home to its own water park and seaside roller coasters, not to mention a colorful tasting pallet of restaurants. If the day is hot, cool off at Myrtle Waves, a seasonal water park that has over 30 rides and a cult-like following by locals. Spend an elegant evening at the vibrant Italian restaurant, Villa Romana, a beachside locale that has a near-perfect rating. Arrive to your reservation on time and in style by scheduling a stretched limousine from area transportation companies. When you’re done eating, explore other Myrtle Beach gems like the high-end wine at Library Restaurant or poolside cocktails at the chic and popular Island Vista Resort. Myrtle Beach is home to thousands of hotel rooms, hundreds of restaurants, and dozens of unique attractions, making it the perfect place to take a lot of people. Spend the day at the iconic seaside by reserving a big enough vehicle with ground transportation services. By getting one of the company’s chartered buses, you’ll not only give your team the benefit of showing up to their location on time, but offering up the memory of getting there together. The city of Myrtle Beach wouldn’t have its name if it weren’t for the location, and once you visit you’ll see why. With a long strand that goes on for several miles, it’s easy to get lost on a long walk beachcombing for seashells or bringing the family out to build a sandcastle. There is so much to explore here and the area truly has something for everyone. → Myrtle Beach State Park is located just south of the city of Myrtle Beach. It is a great getaway from all the hustle and bustle of the resort area of Myrtle Beach and many visitors enjoy all of the activities you can indulge in here. Fishing is ample and you can find hiking trails, campsites and more. Admittance into the park is only a small fee for adults and children age 6 and over and is free for children 5 or younger. 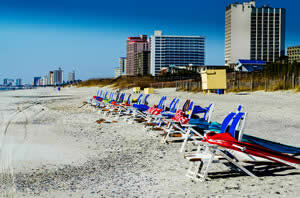 → Myrtle Beach has just shy of fifty beach access points amongst its hotels and resorts. These beaches, while they do tend to be crowded, are very popular due mainly to the fact that for most out-of-towners they are walking distance from your hotel. 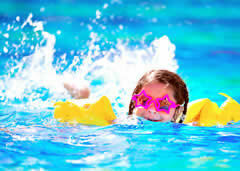 Some even offer extra amenities like playgrounds for your children. → Myrtle Beach Boardwalk spans almost a mile and a half stretch of Myrtle Beach and it is easily one of the most favored spots in town. The area was recently revamped and both locals and tourists have now made it a must-see area of this popular vacation destination. Here you’ll find bars and restaurants, stretches of dune perfect for a leisurely stroll and even the popular SkyWheel. 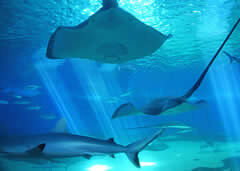 Ripley’s Believe it or Not hosts a lot of strange events and special occasions, one of which is the Ripley’s Aquarium in Myrtle Beach. Featuring a large collection of exotic and unbelievable wildlife, the aquarium is a sure way to dazzle the hearts and minds of children and adults alike. The Family Kingdom Amusement Park is essentially the Coney Island of South Carolina. As a seaside amusement park, the rides keep going until the night time, lighting up the beach with bright rides that are specially designed for families, children, and even toddlers. Myrtle Beach International is owned by the local city county, but is run as if it’s part of the state. Located just three miles southwest of Myrtle Beach’s central business district, the airport offers a great look at the Atlantic Ocean and also offers a variety of transportation. If you’re in a large group or family, there are several shuttles to choose from, whether it be the lovely people at Myrtle Beach Airport Shuttles, which offers cheaper fares than taxis, or the many car rental services available just outside of baggage claim. For an affordable and casual stay, visit the Super 8 Myrtle Beach, a modest hotel that offers oceanfront views, free Wi-Fi, and a full continental breakfast. If you’re looking to spend a few more dollars for a big difference, Springmaid Beach Resort offers deluxe suite rooms with ocean views, not to mention a mini-golf course. The Rioz Brazilian Steakhouse is an upscale restaurant meant for lovers of meat and admirers of what a high-class steak should taste like. If you’re more in the mood for Italian, visit the 5-star restaurant, Villa Romana, a cheery space with Italian-American cuisine that ranges from posh dishes to familiar fare. Myrtle Beach itself is home to a slew of different experiences – whether it be the Myrtle Beach Boardwalk, the Springmaid Pier, or one of the many boat tours floating about the coast, there’s an adventure waiting around every corner.